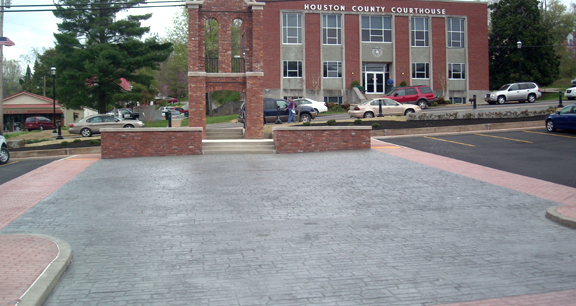 Project obstacles and solutions: The City of Erin, Tennessee contracted with Marcor Construction to renovate their downtown sidewalks, crosswalks and a parking lot adjacent to the Houston County Courthouse. The job required two stamp patterns and color combinations. IMI supplied 132 yards of imix Spectra colored concrete for this project. The job was poured and completed in January—February 2010. Bad weather conditions threatened to delay this project and would have led to penalties incurred by the contractor. IMI was able to keep concrete consistently flowing to the job site during good working days. IMI personnel not only delivered concrete, but also made sure color release and sealers were available at the site as the contractor needed them. This reduced any down time. Marcor Construction was able to finish the job on time.